As I already mentioned in my August RoundUp, I have a new addition to my skin care routine: rosehip oil. 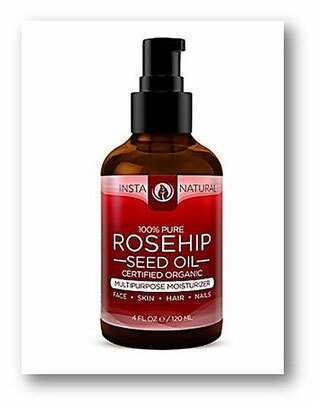 I included rosehip oil into my skin care routine because of its effective ingredients. It consists of vitamins, antioxidants and essential fatty acids. They help the skin to restore its youthfulness and to combat signs of premature ageing. Here are five benefits of rosehip oil. Rosehip oil helps reducing fine lines and wrinkles because it contains high amounts of vitamin C, A, and lycopene. Both Vitamins stimulate your collagen production. Besides that, vitamin A is a small molecule. It can penetrate deeper into the skin and improves the skin’s moisture levels. Vitamin C and lycopene can also repair the skin's surface and restore its elasticity. All of this leads to firmer, more youthful looking skin and who doesn't want this. Like I mentioned in a previous post, the sun can damage your skin causing discoloration, dark spots and decrease of collagen, resulting in premature skin ageing. The antioxidants in rosehip oil combat free radicals to protect the skin against the effects of the sun. Furthermore, the vitamin A, combined with the oil’s essential fatty acids, can improve already visible skin damage by bettering the skin tone, texture and pigmentation. Vitamin C and A also counteract the decrease of collagen through sun exposure. Please keep in mind that also the antioxidants of rosehip oil combat photo-ageing, it is not a replacement for your sunscreen. If you suffer from scarring or eczema, using rosehip oil can alleviate these skin conditions. The main constituents responsible for this are the essential fatty acids. They are emollients which improve the skin’s flexibility as well as the permeability and help the skin regenerate/repair itself. More than that, these essential fatty acids aid in reducing dry and itchy skin, the common symptoms of eczema. The vitamin A plays a role here as well since it has the ability to improve skin texture and tone. If you shied away from using oils in your skincare routine, because they left an oily residue on your skin, you should try out rosehip oil. It is much lighter than other oils, non-greasy and therefore is absorbed quickly into your skin. Last but not least the efficiency of rosehips has been proven throughout the centuries. Because of their healing properties, the Egyptians, Mayans and Native Americans used rosehips as a remedy. The Britains even made syrup out of the oil and handed it to children during wartime to strengthen their bodies defences. 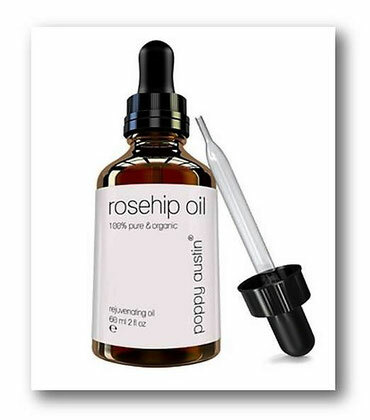 A good rosehip oil comes in a dark container to prevent rancidity, many of them are enriched with vitamin E to further improve their shelf life. I store mine in a drawer to maintain the quality of the oil. Furthermore, I would opt for a cold-pressed oil. They haven't been altered by heat and, therefore, retain more nutrients. After using rosehip oil for almost eight weeks, I can see real improvements in my skin texture. It is less red, more moisturised, has a healthy glow, and fine lines are reduced. 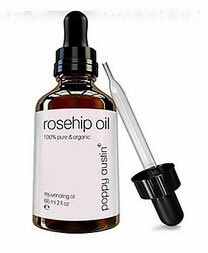 If you search for a product to improve your complexion, I highly recommend rosehip oil. Toller Post; ich benutze nun das Arganöl schon regelmäßig. Was empfiehlst du als Routine mit den verschiedenen Ölen? Kann ich die mischen, oder soll ich jeden Tag ein anderes benutzen oder morgens das eine abends das andere? Vielen Dank für eine Antwort! You are so awesome! I don't think I've read through a single thing like that before. So great to find another person with unique thoughts on this subject matter. Seriously.. thanks for starting this up. This website is one thing that is needed on the internet, someone with a bit of originality! Just desire to say your article is as astounding. The clarity on your put up is simply great and i can suppose you're a professional on this subject. Fine together with your permission allow me to clutch your RSS feed to keep updated with imminent post. Thank you 1,000,000 and please continue the rewarding work. Thanks for your marvelous posting! I genuinely enjoyed reading it, you happen to be a great author. I will ensure that I bookmark your blog and may come back sometime soon. I want to encourage you to ultimately continue your great writing, have a nice day!